There's a great moment in Slither, the B-grade horror/comedy, when the hero, Officer Bill Pardy (Nathan Fillion), is being choked in his office by a rampaging zombie deer. It sounds very funny (and it is! ), but it's also a nail-biting moment of suspense. Such is the genius of this film. As we've noted before, we've recently been inundated with the horror genre here at the PPCC - from the drawling bore of Underworld: Rise of the Lycans to the camp classic that is Ghostbusters. Simon Pegg's endearing Shaun of the Dead was our favorite-so-far, but it's been ousted today by the far funnier, far grosser Slither. Whereas Shaun of the Dead relied much on the charm of Simon Pegg as our favorite nerd-with-a-heart-of-gold (and he is, yes, so cute! ), Slither is much more concerned with being the most disgusting, most absurd and hilariously presented B-film we've seen in a long time. And it succeeds. Somewhere from the deepest, darkest reaches of outer space, a meteor crashes into a poor, forgotten, Confederate flag-waving town in the American South. This town doesn't have that false sense of mummified 1950s Americana as in Waitress, rather it resembles the poor white realities of trailers, chain fast food and trucker hats (so, more like The Wrestler). Anyway, the meteor. So Grant Grant (Michael Rooker) and his wife, Starla Grant (Elizabeth Banks), have a minor disagreement one evening - while the hunky policeman, Bill, looks on (he's been pining for Starla since forever). 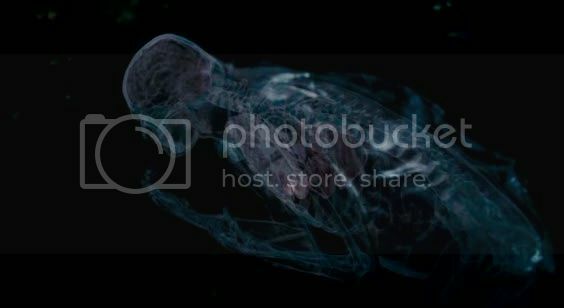 During Grant's walk in the woods to cool off and get some air, he discovers the meteor - and is promptly attacked by a small worm-like parasite that squirms out of the smoldering space ash and into his diaphragm before clamping onto his brainstem. Now possessed by the alien slug, Grant begins to sprout slimy tentacles, weird rashes and an insatiable hunger for MEEEAT. MEEEEEEEAAAT. After kidnapping and sucking the life force out of a local girl, as well as being spotted by Bill and his police posse, he is dubbed the "squid" and tracked by the terrified, bumbling townspeople. Lots of really inventive gross stuff then happens. Like a demented episode of House. Has anyone in the PPCC readership seen David Cronenberg's The Fly? There's an iconic scene in it when the twitching, crusty, fly-man anti-hero, played by Jeff Goldblum, vomits on his food before eating it. It's all part of fly digestion! he says, while his girlfriend (and the PPCC, and the whole audience) looks on in gaping horror. 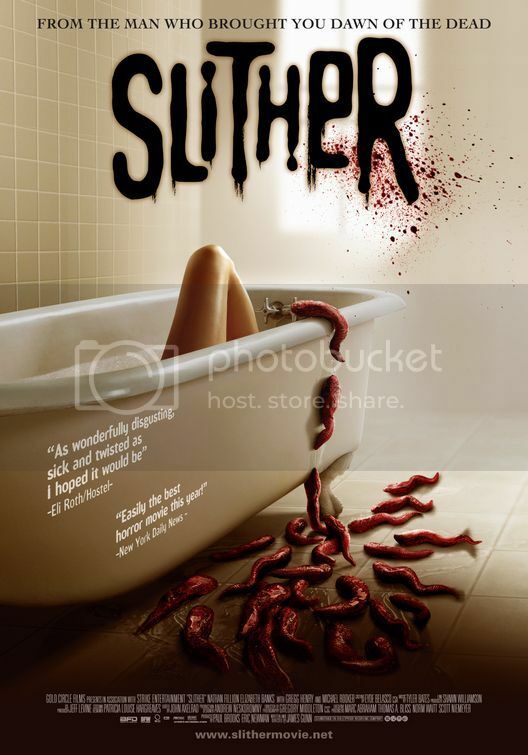 Well, if you found that scene disgusting, but sort of... hilarious, and you kinda wanted to watch it again just so you could laugh at it, then Slither is for you. DO NOT watch it with any beverages around (as you will spit them) nor any food (as you will probably throw it back up) - the film is a strong mixture of the nauseating coupled with the very funny. In fact, we spent so much of the film laughing and swallowing back our lunch, that we didn't realize how insidiously scary it also is - indeed, it's a testament to the quality of the filmmaking, which juggles moods deftly. There's the scene where we first see the alien slugs in all their squirming, multitudinous horror - the characters are screaming, the violins are shrieking, and something touched our thigh. PPCC readership, we tell you now that we jumped so high we nearly slammed against the ceiling. So, yes, it is also a fairly scary film. But it is also a lot of fun, if watched responsibly. Where by "responsibly", we mean: with company, in full sunlight, without any food or beverages or children around. Enjoy! I wonder why there weren't any of these aliens in Firefly if Maly had them on his home planet?